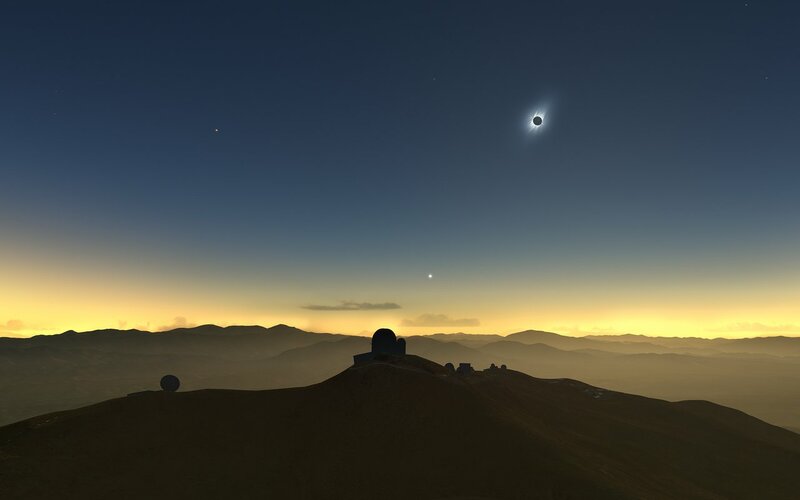 On Tuesday, 2 July 2019, invited guests will witness darkness during the day as a total solar eclipse passes over ESO’s La Silla Observatory in Chile. Total solar eclipses are rare phenomena — one occurs on average at any specific location every 360 years. For people watching a total solar eclipse in the path of totality, it is an experience of a lifetime. What makes the 2019 total solar eclipse special at ESO, is that it can be witnessed from ESO’s La Silla Observatory, a place where access is granted only to few people. La Silla is the first observing site of the European Southern Observatory (ESO), and celebrates its 50th anniversary in 2019. At its inauguration, La Silla became the largest astronomical observatory of its time, leading Europe to the frontline of astronomical research. Since then, La Silla has led to an enormous number of scientific discoveries, including several science “firsts” (see Science Top-10). With over 300 refereed publications attributable to observations from the observatory per year, La Silla remains one of the most scientifically productive observatories in the world. the ESO 3.6-metre telescope, which hosts the world’s foremost exoplanet hunter: HARPS (High Accuracy Radial velocity Planet Searcher), a spectrograph with unrivalled precision. the 3.58-m New Technology Telescope (NTT). It was the first in the world to have a computer-controlled main mirror and broke new ground for telescope engineering and design paving the way for Very Large Telescope. Moreover, La Silla hosts several national and project telescopes. More information about telescopes in operation and decommissioned at La Silla is available here. Invited visitors will have the chance to witness this spectacular event from a unique viewpoint at the observatory, while taking in the gorgeous scenery of the Atacama Desert. The 2019 phenomenon is the only total solar eclipse visible from an ESO observatory for the next 212 years. An annular eclipse will be visible from La Silla next century, on 9 January 2187. In addition to chance to witness the total solar eclipse, visitors will be able to tour the La Silla observatory, listen to talks, and participate in other activities before the eclipse. More information will be available closer to the eclipse itself. La Silla is a working observatory where astronomers perform observations every night, and therefore we can only welcome a limited number of people for this special event. Other international observatories in Chile are preparing for this unique event and more information will become available on the CONICYT website. This video describes what happens during a solar eclipse, and what a viewer could expect to experience at ESO La Silla Observatory in Chile. A Spanish version of this video is available here. Download options and the full credits for this video are available here.